Web Accessibility / A11Y is finally on a path of owning more mindshare in the web development community. It has a long way to go but will get there eventually when we learn more about all the positive side effects gained from injecting basic web accessibility practices into our workflow. Learning about web accessibility can be a daunting task, which probably why it is taking so long to become automatic for developers to include in their code. A11Y is not hard to learn, but resources are scattered and not very fun to soak up. There are, however, tools popping up to make this easier which is great for you and A11Y. Ideally web accessibility should be considered in every phase of a project: Discovery, Content Planning, IA, Design, Prototyping, Development, QA and beyond. In this post we are going to focus on the workflow/tooling development phase. Tenon.io is a totally awesome web accessibility testing platform that you must check out! It is headed by web accessibility specialist Karl Groves. You can visit Tenon.io and plunk in a url to perfom robust web accessibility tests in your web browser. While this project is in its early phases (beta currently at the time of this post), it will only get better and I’m very excited about its potential. Tenon.io has opened up their API up to the public and have created Grunt/Gulp tasks for everyone to use… lets see how we can do it! Grunt Tenon Client is a Grunt Plugin for the Tenon Accessibility Testing API. While Tenon.io makes it super simple to test websites using their web services, there is a way to take advantage of their great API using a Grunt plugin. There is also a Gulp version of this. I am going to walk through the basic setup of this Grunt plugin. **I assume you know what Grunt.js is. I also assume you understand how to configure and manage a basic Gruntfile and that you know how to use NPM. Here is a quick video demo (no sound) of Grunt Tenon Client in action. In this video I am running Grunt and then making edits to an html file that has accessibility issues in the page so we can see the Tenon catch them. ###Step 1 Obtain API Key You will need to sign up for a free account at Tenon.io. Once your account is approved you will be given a unique API key. filter: [31, 54], // The tID maps to the specific unique ID for the test that was failed. snippet: true, // show code snippet for errors? Make sure this task is part of the watch task or create a separate task to run Tenon on it’s own. ##Step 4 - Watch for errors After you have Grunt setup and running it is time to start testing. 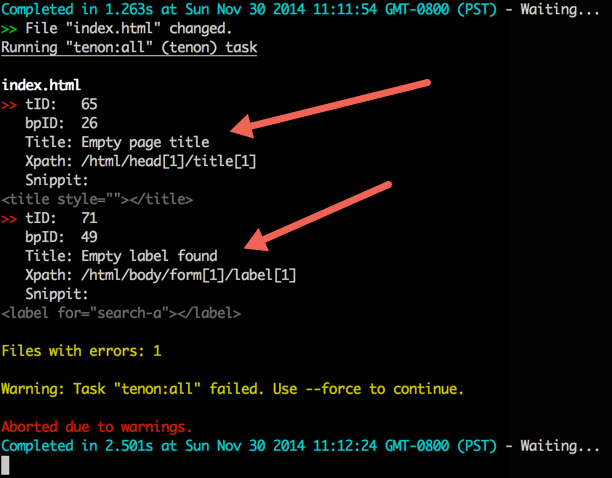 Make an edit to some HTML and watch the terminal for errors from Grunt Tenon Client. I created a project that includes starter files that you can grab from Github. I hope you consider integrating this tool into your workflow.